Update: ESPN says the game averaged 26.2 million viewers across ESPN, ESPN2, ESPN News, ESPNU and ESPN Deportes with the mothership accounting for 25.7 million of it. More details on viewership via ESPN can be found here. Alabama’s win over Clemson in the 2nd CFP Championship earned a 15.8 overnight rating on ESPN per Sports Business Journal’s John Ourand and a combined 16.0 overnight including Megacasts on ESPN2, ESPN News and ESPNU. That’s down 14.6% versus the 18.5 overnight garnered for the inaugural Ohio State vs Oregon CFP Championship game a year ago on ESPN when the combined w/MegaCast rating was an 18.9. Given that the game was close deep into the fourth quarter it’ll be difficult for CFP Executive Director Bill Hancock to play the “game was a blowout” CFP ratings excuse bingo square as he did with the CFP Semifinals. But the “last year there was a bigger curiosity factor because it was the first CFP championship” square is still in play (at least somewhat accurately, in my opinion). 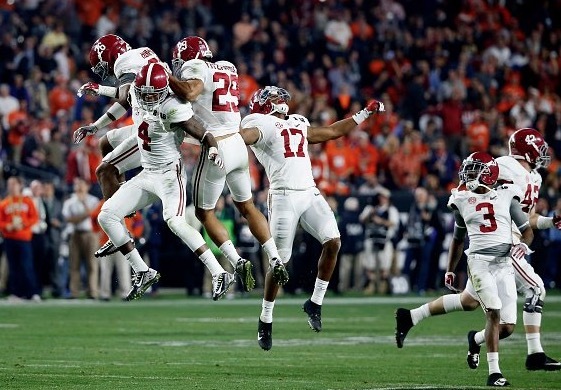 ESPN’s Megacast presentation of the College Football Playoff National Championship Presented by AT&T on January 11, 2016 – an Alabama 45-40 victory over Clemson – delivered a 16.0 overnight rating, ESPN’s third-best overnight for any game, ever, across all sports. Among the six national championship games ESPN has televised, last night’s CFP National Championship scored a higher overnight than the final three BCS National Championships (2011, 2012, 2013 seasons), and trails only last year’s inaugural CFP National Championship and ESPN’s first ever national championship game (2010 season). Birmingham was the No. 1 local market, earning a 59.2 overnight, the market’s third best overnight for a post season college football game on ESPN. Greenville was the second highest local market, achieving a 39.0, the market’s best overnight ever for a post season college football game on ESPN. The top 10 metered markets: Birmingham (59.2), Greenville (39.0), Atlanta (30.1), Nashville (29.1), Knoxville (28.4), New Orleans (25.6), Jacksonville (24.8), Columbus (23.0), Charlotte (22.8) and West Palm Beach (20.3). ESPN Megacast: Overnight rating only accounts for ESPN, ESPN2, and ESPNU as SEC Network, ESPNEWS, ESPN Classic and ESPN Goal Line are not Nielsen rated networks.